The O.G. 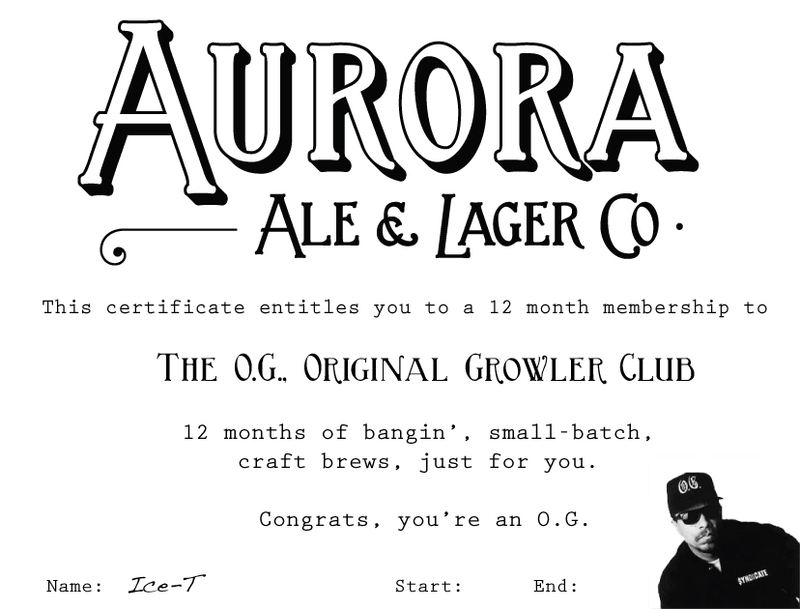 Club - Aurora Ale & Lager Co. Introducing our growler club! Fresh monthly fills of great beer, tons of perks, like discounted growler fills, free flights, a free glass growler, and priority access to our super-limited beers! Memberships are paid up front for 12 months periods. You can choose to fill one or two 64oz growlers per month (at the same time or separately). You'll have a choice of which beer you can fill. Stop in, say hi, fill it up, and be on your way. It's that simple. *Please note: Some beers are not eligible for club fills. “Imperial” or high ABV and some specialty beers can be filled for an extra cost. Please ask for more details. *Memberships can be put on hold for one month with notice. If you miss one month, you may double up on the next month to catch up, but after that your previous month's fill expires. ​-O.G. Club members will receive priority access to one-off and limited batches of draft and bottled beers. This is huge, because the club alone could be large enough to kick a batch, which means it would be exclusive to club members only.